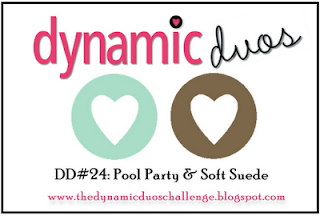 Time for a new color duo at Dynamic Duos! This week we want to see your creations made with Pool Party and Soft Suede. 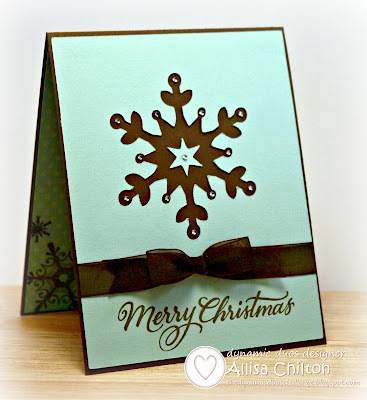 I have a fondness for blue and brown snowflake cards, so a Christmas card it is! I went with Pool Party by Stampin Up and Cocoa by Close To My Heart. I initially had plans for fancy layers on my snowflake. During assembly, I decided I loved the CAS styling of just having the negative cut out with a little bling added. My snowflake is from the Artiste cartridge. 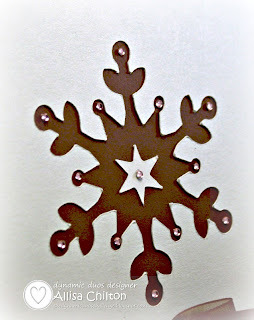 I cut the snowflake out of my Pool Party cardstock and mounted the negative portion onto my Cocoa cardbase. I added a little bling with Bitty Sparkles, no snowflake is complete without a little bling! I carried the snowflake theme into the inside of the card by stamping snowflakes in Cocoa ink on Pool Party DSP. The Warmest Wishes sentiment is from the December Stamp of the Month, Very Merry Christmas. How stunning! ... Might have give that combo a go myself! I like the blinged out CAS look of it too Allisa! Another winner of a card - this is spectacular! Absolutely gorgeous! What a great CAS card! Thank you for joining us at Shelly's Images. Please come back and join us again real soon. Wow! This is absolutely gorgeous!! One of my favorite color combos!! So pretty!